Members of the Roanoke Vineyards wine club tasting 2008 reds in the Wolffer Estate cellar. Friday night, on a cold, windy East End night, I joined 20 or so members of Roanoke Vineyards' wine club at Wolffer Estate Vineyards (where Roanoke's wines are made) to taste Roanoke Vineyards' 2008 reds from barrel. It was part wine club event, part futures tasting -- the winery's first -- and offered an excellent opportunity to taste these wines for the first time. Plus, it's always a pleasure to taste and talk with winemaker Roman Roth and Roanoke Vineyards co-owner, and long-time grape grower, Rich Pisacano. 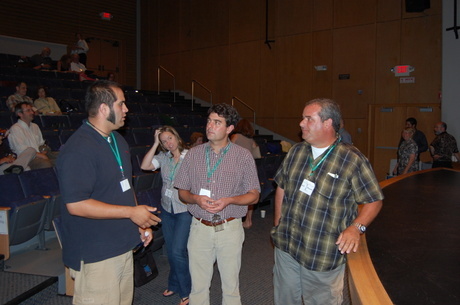 After hearing Pisacano (pictured at right) tell the tale of the 2008 growing season at his Riverhead vineyard, I think he would be bored and possibly miserable if he were growing grapes in the Napa Valley or any other hot, dry region. I'm serious. I think it'd be too easy and stress-free for him. Think about that for a minute and then I'll point out that his favorite grape is cabernet sauvignon. 2008 was a fairly typical growing season on Long Island. It started a bit slowly, with cool spring temperatures that delayed bud break but higher-than-average temperatures in the summer and fall helped vineyards catch up. Intermittent periods of high humidity and disease pressure meant however that, according to Pisacano, things "didn't come easy." "2008 was an exciting, fun, memorable year because you didn't win easy," said Pisacano, adding "In this climate, we fight the fight, and we delivered fruit that was mature." Pisacano added that, particularly in years like 2008, he "manipulates the vineyard so that there's not a need to manipulate the wines in the cellar." That was when Roth, who has worked with Pisacano for many years, added "There is a goal for perfection." We tasted 7 wines, and even in their youth, each shows potential. High-toned red fruit with black pepper and hints of toasty vanilla and "good" green. Ripe, good length and a bit of green olive salinity. A little austere, this flagship wine is just a baby. Pretty red and black cherry with hints of cocoa powder and a floral edge. Grippy, but ripe, tannins. Long, elegant finish. Rich color. Spicy with blueberry and darker fruit and a round, warm vanilla edge. Some American oak-coconut peaking through. Oak is a bit forward now, but this is another baby wine. No underripe flavors or astringent tannins. More new oak than the 2007 (40% this time). Plummy with blackberry and raspberry, baking spice. Rich fruit core with chocolate and coffee on an elegant finish. Dark fruit -- blueberry and fig -- with chocolate, licorice, cherry confection and leathery hints. Complex even at this stage. A little lead pencil in the background. Oak understated, mostly coming through as vanilla. Bright red cherry with big aromas of molasses, milk chocolate, mint and spice. Ripe on the palate with impressive complexity for this stage. Elegant, but full-flavored and well structured. Special bonus. Extremely taut and closed, but shows some classic Long Island traits. Cherry and focused lead pencil/graphite. A little earthy. Hard to evaluate really. There have been rumors about this event swirling for weeks, but as of today it's official -- Sip, Savor & Shop, a showcase for New York wine and food, will take place on Sunday, December 6 from 2 to 6 p.m.
More than 35 wineries from across New York State will be joined by farmers and food producers, as well as several local restaurants, to present a taste of New York and celebrate the holiday season. Over 100 wines from Long Island, the Hudson Valley, the Finger Lakes, and other regions, will be available for tasting -- and most uniquely be available for sale as well. 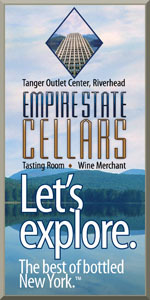 My guess is that more wineries will sign on leading up to the event, but wineries that have already comitted included Anthony Road Winery, Chateau Frank and Dr. Frank Vinifera Wine Cellars, Chateau LaFayette Reneau, Damiani Wine Cellars, Heron Hill Winery, Keuka Lake Vineyards, Shaw Vineyard, Standing Stone Vineyards, Wagner Vineyards, and White Springs Winery from the Finger Lakes, Bedell Cellars, Bouké Wines, Brooklyn Oenology, Castello di Borghese, Duck Walk Vineyards, Laurel Lake Vineyard, Lieb Family Cellars, Long Island Meadery, Macari Vineyard & Winery, Martha Clara Vineyards, Medolla Vineyards, Onabay Vineyards, One Woman Wines & Vineyards, Palmer Vineyards, Raphael Vineyard, Scarola Vineyards, Sherwood House Vineyards, Sparkling Pointe, and Wolffer Estate Vineyards & Winery from Long Island, and Benmarl and Brotherwhood Winery from the Hudson Valley. Tickets are $45 and include wine and food sampling, as well as a souvenir wine glass. They can be purchased from the City Winery website. The New York Cork Report will be involved in this event somehow as well. I'm hoping to have something more to announce in the next week or so. This long over-due celebration of New York's bounty is sponsored by the New York Wine & Grape Foundation in conjunction with other organizations focused on local wines and foods including City Winery, the “Edible” publications, Finger Lakes Wine Country Tourism Marketing Association, Long Island Wine Council, Pride of New York (Department of Agriculture & Markets), and Wine & Food Associates. Not only is Les Howard, a Long Island native and winemaker at Pindar Vineyards, improving the wines at the winery, he's organizing some unique promotions for wine lovers. He has just announced that he has partnered with with Crystal Cruises and Food and Wine Travels to create “Wines and Food of the Mediterranean,” an exclusive Winemaker’s Cruise that sets sail on May 25, 2010 from Venice to Barcelona for twelve days aboard the six-star Crystal Serenity. The Winemaker’s Cruise includes educational wine tastings and seminars, a winemaker’s dinner, a private shore excursion to a winery and much more. Rates start at $4,540 per person -- not cheap, but $2,000 of that is shipboard credit to spend "as you wish." Get detailed information, including a more-complete itinerary. And, if you're interested in hearing more about the event, Les will be hosting an informational session this Saturday, September 12 at 7 p.m. at Pindar Vineyards in Peconic. Mediterranean food and Pindar wines will be served. On Friday, May 8, Bedell Cellars and the Friends of the Sisson Family, will host a fundraiser from 6-9 p.m.
Nena, Jackson and I will be going and I'd encourage every person who reads this blog to attend. 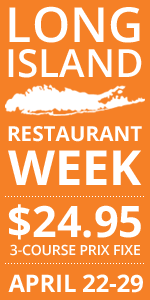 There will probably be some amazing auction lots that any Long Island wine lover would want to bid on. You can buy tickets (or donate if you can't attend) on the event website. After weeks (maybe months) of preparation (much more than I ever anticipated), I'm finally ready, willing and able to announce the newest endeavor I've undertaken -- TasteCamp EAST 2009, a wine blogger event that will bring more than a dozen wine bloggers to Long Island wine country May 1-3 this spring. 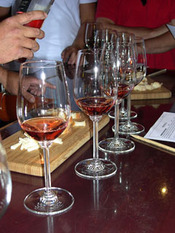 April 4 and 5, Jim Waters, winemaker and co-owner of Waters Crest Winery will host two-session home wine making course. Jim started out as a home winemaker and he definitely knows his stuff. If you've ever thought about making wine at home, I can think of few better sources for knowledge and expertise. The sessions run from 10 a.m. to 2 p.m. both days and the $400 cost (a spring discount from $450) includes everything you need to make 5 gallons of wine and a copy of The Art of Wine Making. Jim's facilities are on the small side, so space is limited. Call 631-734-5065 or email info@waterscrest.com to save your seat. Lieb Family Cellars will be doing wine and chocolate pairings at its Mattituck tasting room every Saturday and Sunday in February from noon - 5 p.m. The pairings will include 5 handmade chocolates by Bon Bon Chocolatier in Huntington, NY with five of Lieb's wines. Roanoke Vineyards is releasing its 2005 Merlot over Valentine's Day weekend. On Saturday, they'll welcome Nunu Chocolates to the tasting room to help celebrate and Waterside Caterers will be there on Sunday. I guess this event isn't in local wine country, but on Channing Daughters Winery will host a wine dinner at Simon Restaurant & Lounge in Las Vegas, NV on February 12. Last but certainly not least, Long Island Winterfest starts February 14. Take a look at the calendar of events and make sure you check out some of the free jazz concerts throughout the month-long festival. On Friday, December 19 at 6:30 p.m., Bedell Cellars and founding winemaker Kip Bedell will library tasting featuring reds from the mid-1990s. The tasting will include nine red wines from the 1993, 1994 and 1995 vintages, including cabernet sauvignon, reserve merlot and Cupola (red blends) bottlings. The evening will open with sparkling wine, feature commentary by Kip Bedell, and continue for approximately 90 minutes. Tickets are by reservation only, and will be limited to 30 seats. Wine club members (and their spouses) are admitted free of charge. The public is welcome for $25 each. The wines tasted will be available for sale that evening as well. I should have the final price list soon. I've already RSVPed and I'm really looking forward to the tasting. I tasted 17 years of Kip's merlot back in 2004 and one from 1993 was among my favorite wines. To RSVP, call Bedell Cellars at (631) 734-7537. Yesterday's LENNDEVOURS Wine Bar event at Roanoke Vineyards was a great success... and a lot of fun to boot. To Roanoke Vineyards for letting us hold the event in their newly renovated back room. It's a great space and I hope to host (and attend) more events there in the future. Thanks Rich and Soraya. To Lieb Family Cellars for bringing and pouring both their 2005 and 2007 Pinot Blanc. The soon-to-be-released 2007 vintage is going to be popular with fans of Alsatian pinot blanc. Thanks Melissa (who delivered the wine just in time) and Gary. 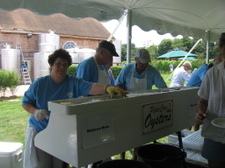 To everyone who came out to support Peconic Land Trust. It's always great to meet my readers and fellow Long Island wine fans. It was especially nice to finally meet Sasha Smith (who writes for LENNDEVOURS), Steve Shaw Jr. of Shaw Vineyard, and Philip and Mark from Snooth. And as I said, it's always a lot of fun to meet readers, so Jay and John, great meeting you too. Last but certainly not least, a heart-felt thank you goes out to my always-supportive wife Nena who really pulled together all of the last-second (literally) details and manned the door, bar and register with skill and patience. If you were at the event, I'd love to hear what you liked and didn't like. You can either leave a comment below or shoot me an email. We ended up pouring tastes of 5 different wines, including two of my wines, a 2007 Rose made at Sannino Bella Vita Vineyard and a 2007 Cabernet Franc made at Raphael. Both were well received. In fact, I think I could have sold a couple cases of both if I had that much left (and had a license to do so). For me, the wines of the day were the Lieb Cellars 2007 Pinot Blanc and the Roanoke Vineyards 2006 Gabby's Cabernet Franc, which needed to be decanted, but really showed nice ripeness, structure and spice. It should be released 9-12 months from now. Thank you again... and I hope to see you all there again next time. LENNDEVOURS Wine Bar @ Roanoke Vineyards, Today 2 - 5 p.m. In just a few hours, we'll be kicking off the first LENNDEVOURS Wine Bar event at Roanoke Vineyards, benefiting the Peconic Land Trust. 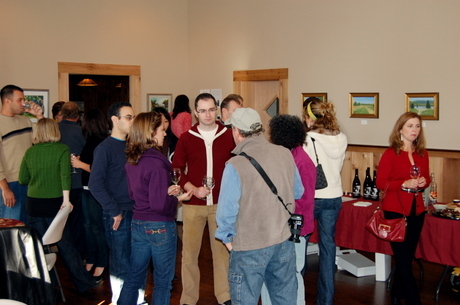 The initial plan was to hold the event in Roanoke's separate Tasting House, which is right next door to the tasting room. I'm happy to report that we've outgrown that space and will now be in the newly renovated back room behind the main tasting room. Late yesterday morning, our RSVP list had grown to 42 people. Attendees will receive a 10% discount on purchases of Roanoke Vineyards wines on their way out the door. To maximize the money we donate to PLT, wines by the glass will be regular price, but with a portion of each glass going directly to the Land Trust. I'll be bringing a few bottles of my 'Sonis Cellars 2006 Hand Crank Red, my 100% cab franc, 100% steel wine that I made at Raphael that year for sampling as well. Assuming I can get on Roanoke's wireless network, I'll be doing some live blogging and posting some pictures throughout the event. Plus, I'll be shooting some video. Keep an eye out for that stuff. I hope to see even more of you there. Come out and enjoy a beautiful Sunday in wine country. I'm happy to announce that we've nailed down all but one detail for the first LENNDEVOURS Wine Bar event at Roanoke Vineyards on Sunday, October 19 at 2 p.m.
Day two of The Art of Balance was just as interesting and just plain awesome as the first day. I'm still working through how to share the NY-related information best, but in the mean time (again) here are some pictures from the day. This one is of Juan Eduardo Micieli-Martinez (winemaker at Martha Clara Vineyards), Vinny Aliperti (winemaker at Atwater Estate and Billsboro Winery) and Richie Pisacano (vineyard manager for Wolffer Estate and co-owner of Roanoke Vineyards). At the time, they were discussing mechanical canopy trimming if I remember correctly.